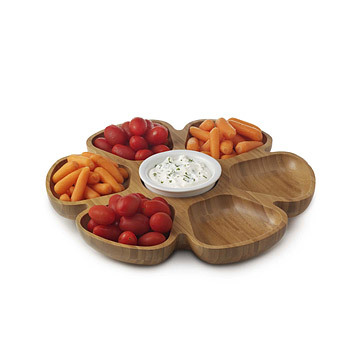 Encourage spinning at the table with this flower-shaped bamboo lazy Susan. With six compartments for serving anything from snacks to condiments and porcelain center container, this lazy Susan makes for convenient party nibbling and reach-free dinners. Made in China. 2.25" H x 14" dia, Cup: 5 oz. Hand wash with warm, soapy water or a damp cloth. Do not microwave. The individual dishes are a little on the small side, but it's pretty and functional. I've gotten it twice, for people who host a lot of gatherings, both seemed happy with it. Received this product as a gift, used it several times to serve appetizers for a small dinner party, and ordered it for a friend who also loves it. She commented that it was easy to store, unlike other lazy susan trays she had looked at. I like the concept of being able to separate the various items in its' own compartment but the lazy Susan doesn't really want to move. There is too much friction. For [$], I expect the product to be exceptional. Now this is a real dish! A timeless decor item--young people and the aged, like me--everyone loves the Bamboo Lazy Susan. Natural wood is great background for all kinds of colorful appetizers, sweets, you name it. I gave this Lazy Susan to one of my daughters and her husband for an anniversary present and they LOVED it. She entertains frequently so this will really come in handy. She loved the color and the receptacle in the middle as the contrast color. I was very please with this product. Thank you! !